CST3007 - 1.4:1 ratio rocker kit. 1.4:1 ratio steel rocker set. 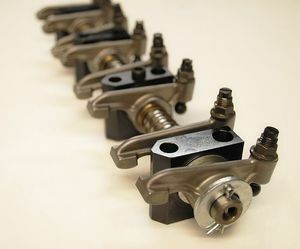 Solid steel rocker arms used to maximise stiffness for weight. Rocker weighs a tiny 82 grams. Set includes CST superior quality rocker adjuster screws, lock nuts, EN16T steel posts and competition thick wall rocker shaft. NOTE: it does not come as a complete assembly, spacers/springs are separate. Rockers are fitted with bearing bronze bushes. Why 1.4 ratio? Simple - years of dyno testing all manner of engine builds with current cam profiles and cylinder head modifications has proven running a higher ratio and more lift is just torturing metal. After all – the valve is only at peak lift effectively for a nano-second. It is what happens between 0.150” and 0.350” lift that is important. No real worthwhile gains are made running to 0.500” valve lift and valve train is put under far less stress. Historic racing regulations are being tightened up so roller rockers of any sort are not acceptable and they are aesthetically more pleasing than bulky aluminium arms.